Traveling secretary Hattie Davish is taking her singular talents to Washington, D.C., to help Sir Arthur Windom-Greene research his next book. But in the winding halls of the nation’s capital, searching for the truth can sometimes lead to murder . . .
Hattie is in her element, digging through dusty basements, attics, and abandoned buildings, not to be denied until she fishes out that elusive fact. But her delightful explorations are dampened when she witnesses a carriage crash into a carp pond beneath the shadow of the Washington Monument. Alarmingly, one of the passengers flees the scene, leaving the other to drown. The incident only heightens tensions brought on by the much publicized arrival of “Coxey’s Army,” thousands of unemployed men converging on the capital for the first ever organized “march” on Washington. When one of the marchers is found murdered in the ensuing chaos, Hattie begins to suspect a sinister conspiracy is at hand. As she expands her investigations into the motives of murder and closes in on the trail of a killer, she is surprised and distraught to learn that her research will lead her straight to the highest levels of government . 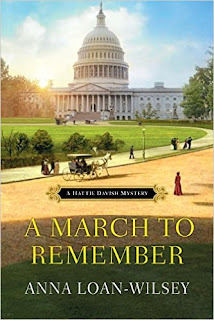 . .
Anna Loan-Wilsey, biologist, librarian, and author, writes the historical Hattie Davish Mystery series featuring a Victorian traveling secretary who solves crimes in every historic town she visits. The first in the series, A Lack of Temperance, set in 1890’s Eureka Springs, Arkansas, (an Amazon #1 bestseller) was followed by Anything But Civil (set in Galena, IL), A Sense of Entitlement (an iBook #1 bestseller set in Newport, RI), and A Deceptive Homecoming (set in St. Joseph, MO, Hattie’s hometown). 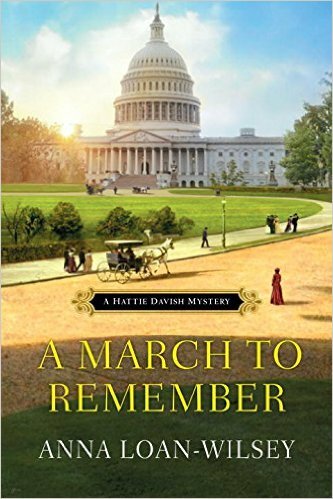 A March to Remember finds Hattie caught up in the political intrigues surrounding Coxey’s Army and the first “march” on Washington, D.C. Anna lives in a Victorian farmhouse near Ames, Iowa with her family where she is happily working on new mystery adventures. I like the historical background. I love historical mysteries and this sounds like a good one. The Cover is wonderful. Please enter me.